Kristen Vogt, a senior Chemistry major, has won the 2018 Priscilla Carney Jones Scholarship from the American Chemical Society. The $5,000 scholarship is awarded by the Society’s Women Chemists Committee. Paul R. Jones established the scholarship in memory of his wife, Priscilla Carney Jones, who faced difficulties as a female chemist early in her career. The scholarship is for junior or senior undergraduates majoring in chemistry or a related disciplines. Since her sophomore year, Vogt has been working in a research group with her faculty mentor Dr. Joseph Baker. Vogt’s research focuses on using computational chemistry to develop a molecular scale understanding of how deep eutectic solvents change the permeability of lipid bilayers to small molecules. Her work to-date has applications in the delivery of antibiotics to bacterial biofilms. After graduation, Kristen plans to pursue a Ph.D. in biochemistry. She hopes to study the influence of chemistry on biological systems and to use chemical principles to achieve phenomena beyond nature’s design. Her future research will have applications ranging from engineering metabolic pathways to synthesizing biofuels, developing genome technologies, and advancing therapies for genetic diseases. 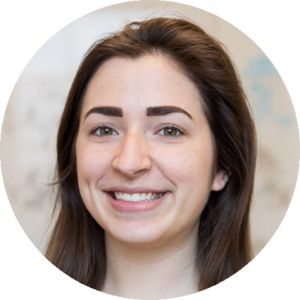 In the long-term, Kristen’s professional aspiration is to perform innovative research and to teach at an academic institution. In the Spring of 2018, Vogt received an Honorable Mention from the prestigious Barry M. Goldwater Scholarship Program.